Following on from my previous post, Peter McKinnon, and Learning to Love Creating Video Again, I spent some time giving my YouTube Channel page a minor makeover to better reflect what my channel is about (art and skateboarding) and what my video release schedule is (aiming for a new video every Tuesday and Saturday). 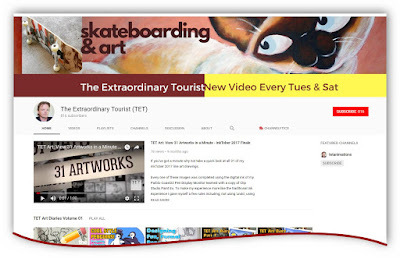 Most of that is reflected in my channel art based upon tips for designing your YouTube channel that I got through being subscribed to Roberto Blake's channel. If you're trying to start, and/or grow a YouTube channel, or just trying to find a way to earn money online using the skills you already have, Roberto gives plenty of useful free advice, as well as linking you to resources to help you out. Roberto will tell you that good channel graphics and thumbnails are vital to a successful YouTube channel and even has graphics packs you can buy if your design skills leave a lot to be desired. Alternatively I've started using Canva to create all my channel graphics, thumbnails, and other social media graphics. Canva is free, cloud based, and includes many beautiful templates that you can modify to suit your needs. So far I've posted two new videos that I tried my best to film quickly and stick to my release schedule of Tuesday and Saturday. Unfortunately my Saturday video was a little late, being uploaded on Sunday, but it was worth it because I think I've found a style I want to develop for my videos that no one else is really doing. If you study the way both videos were made you'll notice I like using overlays/inserts of video on top of the main video. If you look at the second video I've also broken the screen up into panels each with different video running in them - almost like a comic book page. I'm thinking about developing that approach even further to turn my videos into something of a modern motion comic but not specifically making them look exactly like comic books. By doing this I can put a lot of information into each scene and keep my videos to a shorter length, as I can communicate my ideas in a more non-linear format. At the same time, doing this is helping to make the editing process more interesting for me, as I now have the challenge of developing this style further. I will be posting videos to this blog as I create them which may mean I post more than once a week (because I don't want this blog to be just posts accompanying my videos). It's still a bit of a struggle to get motivated to film and edit videos but it's only been a week of the new schedule. It's just a matter of making sure I give myself enough time, and try to streamline my new style so it doesn't take as long to edit as my last video did (3 days). So, if you watched the two videos above and found one or both of them were of interest to you, why not consider subscribing to my YouTube Channel. I could really use the company and I'd love to have you as part of my community.